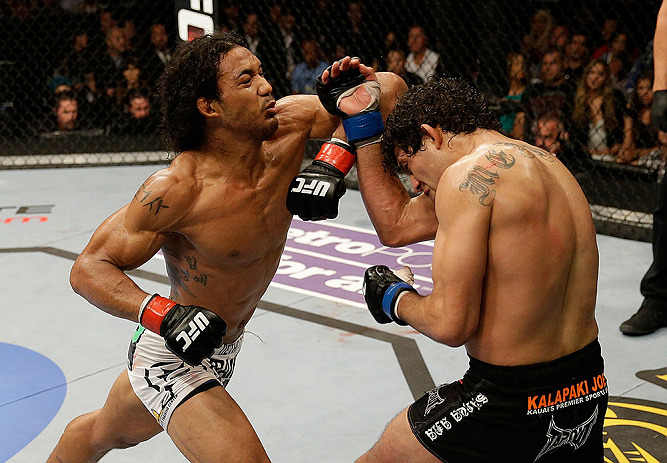 As Benson Henderson prepares to enter the Octagon for the third time in 2014, it would be understandable if the man known as “Smooth” were experiencing a little déjà vu, given that this year carries a number of parallels to 2011, his first year in the UFC. Just as he did three years ago, the 30-year-old lightweight began the year looking to rebound from a championship loss to Anthony Pettis, having dropped the title to his chief rival at UFC 164 the previous summer. While their battle at WEC 53 came down to the last minute of the last round of the last fight in the organization’s history, their second meeting last summer was much quicker, but no less painful for Henderson, who was forced to tap to an armbar late in the opening frame. Much as it did three years earlier, Pettis’ win propelled “Showtime” into the spotlight and relegated Henderson to the background, forcing him to the back of the line in the loaded lightweight division with an even longer road than usual standing between him and another shot at UFC gold. Working in Henderson’s favor, however - just as it was in 2011- is the fact that the championship belt has been put on the shelf for the time being, forcing contenders to continue competing in order to strengthen their cases for a shot at the strap once it is back in circulation. Three years ago, a draw between then-champion Frankie Edgar and challenger Gray Maynard made an immediate rematch between the two a necessity, and injuries would prevent the bout from taking place until October. This time around, an injury to Pettis and his eventual selection to coach on Season 20 of The Ultimate Fighter opposite former Strikeforce titleholder and top contender Gilbert Melendez has put the belt on ice until December, meaning it will be well into the new year before anyone else gets a crack at the lightweight championship. In 2011, Henderson started the year with victories over Mark Bocek and Jim Miller before dominating Clay Guida to cement his place as the top contender in the 155-pound ranks and he’s on course to do the same in 2014, having already captured victories over Josh Thomson and Rustam Khabilov heading into Saturday’s main event showdown with Rafael dos Anjos. Henderson lets out a laugh, happy to poke fun at himself, aware that we both know his statement is all kinds of false. While he may not have spent time comparing and contrasting his initial year in the UFC to his current situation, the former WEC and UFC lightweight champion is unmistakably cerebral in his approach to his craft. He just doesn’t worry about elements that are outside of his control and talking points that ultimately have no impact on what he’s trying to accomplish, opting instead to keep his focus on achieving his short-term and long-term goals. “It’s not that I don’t care, but I don’t really care,” Henderson laughs, explaining the tunnel vision he has when it comes to looking at his career and the road ahead. “People can say this, say that - I’m more focused on what I can control. Like every fighter, Henderson has goals that he wants to reach before he decides to hang up his gloves, do away with weight cutting - “(It’s) my least favorite thing about fighting” - and joyously indulge in guilt-free eating. What makes him a little different, however, is that he’s set a time limit for himself. “I have a lot of goals, but No. 1 is getting that UFC lightweight championship belt around my waist,” Henderson, who intends to walk away from the sport at the age of 33, explains. “Some people have a long-term goal - `I want to do this’ - but they set no timeframe. Well, when are you going to do it? Are you going to wait until you’re 50 to do it? “To be realistic, when you give yourself goals, you have to give yourself some sort of timeframe. Plus, this sport is very tough - you get hit in the head not just during fights, but in practice. I don’t want to take any more additional damage - I’ve been hit in the head enough times already in my career, I don’t want to get hit any more after a certain age. While knowing that his career has an expiration date could serve as an explanation of why Henderson is making an expedient return to the Octagon having just fought at the start of June, his coach says there really hasn’t been anything different or hurried about their preparation for this weekend’s encounter with dos Anjos. In fact, very little has changed for Henderson in recent years and that’s one of the attributes Crouch appreciates most about his long-time student. “People see a different camp or focus, this or that, but Ben’s the same,” Crouch says. “He’s in the gym grinding, he’s getting better and he’s going to come out and give you 100 percent. I don’t know why people aren’t crazy about him because he represents what’s good in people - that willingness to grind through, make the best and give your best in all situations. “That’s one of my favorite qualities in any person, and to watch him go in there, competition after competition and do nothing but give his best? I have so much respect for him. It’s an awesome thing. While it’s not Henderson’s style to come out and add an emphatic “Yeah!” on the back end of his coach’s assessment, the confident contender is more than willing to compare resumes with anyone else in the organization. And that’s where his pursuit of his goals and lack of concern about anything outside of achieving them becomes even more impressive. Sporting a 9-1 mark inside the Octagon and a 14-2 record split between the WEC and UFC that includes lightweight title reigns in both organizations, it would be easy for Henderson to rest on his laurels and look to improve his place in the pecking order without putting himself in too much danger, but that’s not the way he’s built. He wants to reclaim the title he once held and he’s ready to go through everyone in the division in order to make that happen. “It sounds cliché to repeat it, but I don’t think about it. I don’t care,” Henderson says of the potentially long line of challengers he could have to face in order to earn another title shot. 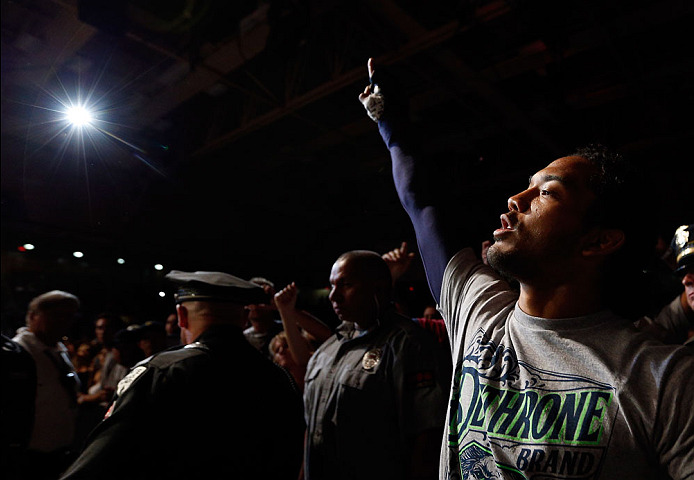 “What I focus on is me - making sure I get my hand raised against everybody I step into the Octagon no matter who I’m up against. “It doesn’t matter if they’re a stud up and comer or if they’re the No. 1 fighter on the planet, they have the belt - whoever it is, whatever the situation is, I can’t control those situations and ultimately they don’t really matter. What matters is getting your hand raised. Of course, the clock is ticking.